Cocktail, or beverage? Your call: What’ll it be? When I waited tables, one of my cohort, a guy named Frank, regularly approached his patons with the same routine. He’d bid them a good evening then ask (in a tone some of us likened to a mortician’s), “Cocktail, or beverage?” — a loop that plays over and over in my head whenever someone offers me a drink. These days the options are endless and the answer to that question depends, of course, on where I’m drinking. If I’m at Poppy — as I was Thursday night — it might be the ruby-hued Papi Delicious — a mix of hornitos plata and curacao socking-it-to-me with hits of jalapeno, lime and mint, garnished with red bell pepper. If it’s Place Pigalle, the drink is inevitably the Marianna Cocktail. Pretty in pink, that lime-stoked luxury offers a measure of Campari providing a bitter blush. When I’m lunching at Matt’s in the Market on my “off” hours and Robbie McGrath’s mixing and pouring, I’ll treat myself to his outstanding Bloody Mary. At Licorous, my favorite sip is the Shiso Fine — made with shiso-infused vodka, lime and pineapple. When I’m in the comfort of my home, my most frequent pour is cold sake served in a chilled martini glass and garnished with pickled onions — preferably enjoyed in the company of my husband, whose evening sip is a “Titan Manhattan” (his house specialty — Jack Daniel’s as base, heavy on the sweet vermouth, kumquat garnish). And since we’re convinced that a family that drinks together (in moderation, of course) can be a wonderful thing, Nate’s call is a “Northern Lights” — a mocktail with OJ or lemonade, sparkling soda plus a splash of maraschino cherry-juice. Anyway, I was wondering: When you go out, what’s your cocktail-of-choice, and where do you drink it? And when you’re at home, tell me: what’ll it be? Tini Bigs — named one of Food & Wine’s “Top 100 Bars in America” is premiering a monthly mixology class starring a mix of professional bartenders sharing tricks of their trade so that you, too, might enjoy a civilized drink at home, impressing friends and relaxing with family. Sessions will be held the last Saturday of each month and include demonstrations focusing on a particular spirit. 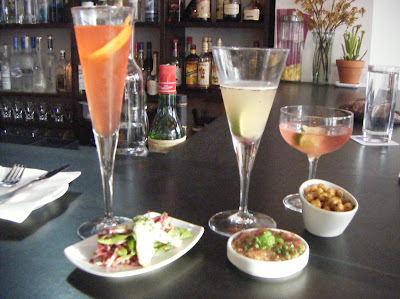 You’ll learn how to craft four cocktails and take home recipes. Here’s the current lineup: May 30 (vodka), June 27 (gin), July 25 (rum), August 29 (tequila), September 26 (cognac), October 31 (whiskey). Classes start at 4 p.m. and admission for each is $35 per person. The fee includes an appetizer sampler but excludes tax and tip. Reservations are required and seating’s limited. Call Tini Bigs to secure a spot (206) 284-5003.